We have start seeing many new platform designs powered with VIA Technologies’ Nano processor especially in nettop and netbook markets. While they are still facing huge challenge from Intel Inc with its new series of Atom families in these competitive market space, the fab-less chip vendor has able to extend its new usage across other PC industries even suitable desktop PC market. 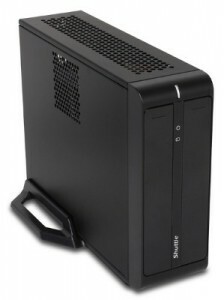 One of the good examples is the new release of XS29 and XS29F Compact PCs from Shuttle recently. Known to be the first VIA’s Nano based PC systems from Shuttle, these two models are expected to be able to deliver high multimedia performance while able to maintain good energy efficiency. Shuttle XS29 and XS29F are using different versions of Nano processors with the first model based on VIA Nano L chip that focuses on performance while the latter one utilizing VIA Nano U series that emphasizes much on lower heat dissipation and power consumption. It also means, users may able to get rid of active fans for more quiet environment if they utilize the Nano U chip while at the same time they can choose to have a better multimedia performance depending on applications. No pricing and availability yet, further details will be communicated to public during the Computex 2009 event early next month.